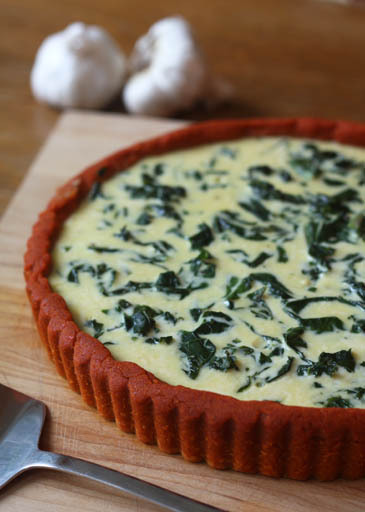 Garlic Kale Tamale Tart – yes, the crust is bright red! August 3, 2009 December 26, 2018 zoe Backyard Urban Farm, recipe, Tart, what I made for dinner! The July issue of Saveur magazine was filled cover to cover with the foods of Texas. Everything from Pecan Pie to Mesquite Grilled steaks. But one recipe caught my eye, not only because it sounds delicious, but because the technique is unlike anything I’ve seen before. It is a Tamale Tart by the chef Stephan Pyles. His version has a soft masa tart shell, a roasted garlic custard and piled high with crab and hot peppers, it looks worthy of a trip to Dallas just to get a slice from his restaurant. Instead of baking the tart he cooks it in a bamboo steaming basket, just as you would for making tamales. It would seem that the crust might get soggy, but it was perfect. The custard was soft, silky and decadently rich. Now that I am a backyard urban farmer I have an abundance of fresh kale. I thought it would go beautifully with the garlic custard and ancho spiced crust. So I gave up the crab and created a lovely quiche like dish that was perfect all on its own, but would be lovely served as a side. To roast garlic: Place the garlic in foil and drizzle with oil. Wrap up the garlic and bake for 40-45 minutes, until very soft. 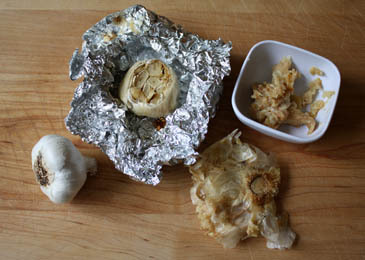 Once the garlic is soft, remove it from the foil, cut off the top and squeeze the roasted garlic out of the skin. set aside. While the garlic is roasting set the cream in a saucepan and simmer, uncovered, until it is reduced to 1 cup, about 25-30 minutes. This is what makes the tart unbelievably smooth and rich. Bring a sauce pan of water to a boil and add the chopped bell pepper. Cook until soft, about 10 minutes. Strain and puree the bell pepper in a food processor. Should make about 3/4 cup, if not, add water until it equals 3/4 cup. set aside. Puree the ancho chiles with 1/2 cup of the soaking liquid in the food processor, then strain through a fine mesh strainer. set side. 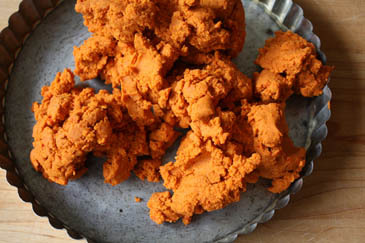 Place the masa, cornmeal, cumin, salt and cayenne in a medium sized bowl and whisk to blend. Put the shortening in the bowl of a stand mixer, beat until fluffy. Add the dry ingredients and mix until it forms pea size crumbs. Add the pureed bell pepper and 6 tablespoons of the ancho chile puree. Mix until it forms a soft, slightly sticky dough. If the dough feels too dry, add water, one tablespoon at a time, until soft and slightly sticky. 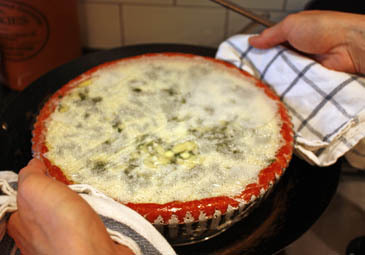 Press the dough until it covers the tart pan evenly and is no more than 1/4-inch thick. Once the cream has reduced and the garlic is roasted you can prepare the custard. Whisk the garlic into the 1 cup of cream, allow to cool slightly and then whisk in the egg yolks. Add the salt and pepper. Saute the kale in the olive oil for about 5-10 minutes or until soft, but still a vibrant color. Add salt and pepper to taste. 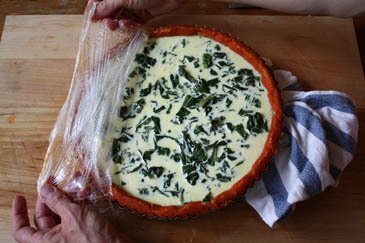 Pour the custard into the tart shell and place the kale on top. 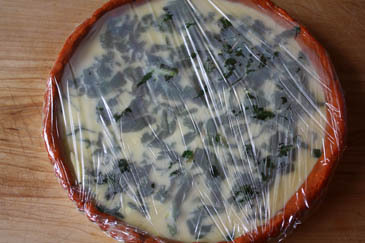 cover the tart with plastic wrap, it should go partly around the bottom of the pan. Place the tart in the steamer and cover it with a tight fitting lid. Allow to cook for about 20-25 minutes, or until the custard is just set. Carefully remove the tart from the steamer with towels. Carefully remove the plastic without damaging the custard, it may be a little difficult to get the plastic out from under the tart pan. I used a butter knife to lift one side and then it came off easily, just be careful of the steam that will come out from under the plastic. 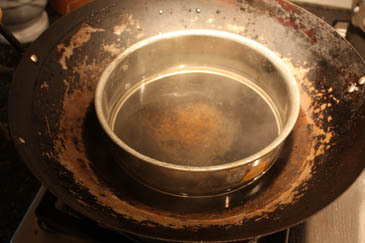 Allow to cool for a while and then remove the out ring from the tart pan. Serve for brunch or as a side dish! I was intrigued by that recipe too, and I love the changes you made. Looks delicious! Looks amazing – I bet it tasted just as good! Absolutely brilliant! this is a celebration of Texas food & tart…beautifully done & great walk through of the process. I couldn’t imagine that steaming was next! 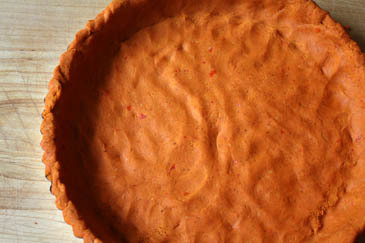 ♥ the idea of a red crust. Aaaah the colour Zoe. Well done!! PS Had a question. Am going to mail you. You always produce amazing, interesting, rare dishes! I love the color of this crust. I’ve always found it curious how so many people refer to the plural form of “tamales” as “tamale”, when it should be “tamal” (without the “e”). Nevertheless, I really like what you made. I bet it tasted great! wow– will send to Texan friends. fabulous! No matter how crabby or tired I am–when I see the email that you have a new post I have to spend time oogling at your beautiful creations and imaging the heaven I’d be in if I were there. Thank you. Amazing images, ideas & pure heart. Wow, Zoe- you are as talented with the savory dishes as you are with the sweet. Beautiful- can you imagine miniaturized tartlets as appetizers? Oh that looks SO good! I love that tart shell. It is a color party!! Another brilliant recipe. Thanks!! This looks absolutely delicious, only I don’t have a. a tart pan, or b. a bamboo steamer. 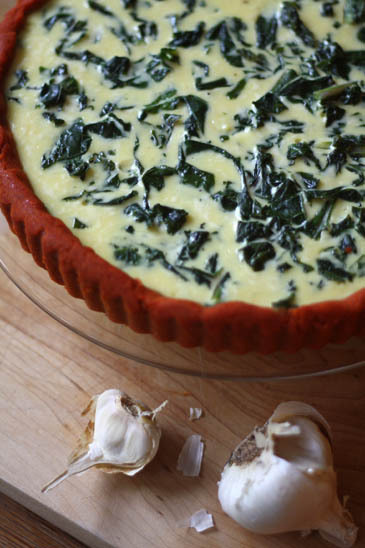 Think it’s ok to try this the traditional quiche way? Also inspired to grow kale!! Thanks for posting! 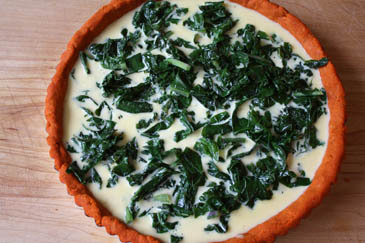 This tart looks fantastic, I love fresh kale. The color in that crust is incredible! Wow. Stunning looking tart. Love your variation with the kale. Is this gorgeous or what? I just want to look at it for a while before I dig in and taste it. Love kale, love red peppers- I will try this recipe soon. The crust is such a beautiful color! Love finding new ways to use kale. ONE bell pepper really made it that red?? It was the one bell pepper plus the ancho chilies that did the trick. Thank you for this glorious recipe adaptation. Lived in TX for 13 years and love this- near and dear to my heart. In the midwest now, but still gravitate to TX-Mex cuisine. Thanks again, beautiful!